The entire senior level of management officials at the State Department exited en masse Thursday, according to a new report from the Washington Post. The move comes on the heels of the Senate committee’s approval of Rex Tillerson for secretary of state and a new executive order to freeze all federal hiring. The Trump administration had been narrowing its search for its No. 2 and three officials at the time of the announcement. Departing members of state include Assistant Secretary of State for Administration Joyce Anne Barr, Assistant Secretary of State for Consular Affairs Michele Bond, and Ambassador Gentry O. Smith, director of the Office of Foreign Missions. Undersecretary for Management Patrick Kennedy, who had served in the department for nine years and had been working with the Trump transition team, abruptly quit as well. Wade further highlighted the dangers implicit in such a move, especially with Trump officials left to fill those positions. The new administration has yet to comment on the resignations. Donald Trump has been in office for a total of six days. UPDATE: A dueling narrative has emerged, as the Trump administration now claims these officials were fired in an effort to “clean house.” CNN’s Elise Labott adds that the White House alerted each of their dismissal. Jacob Sugarman is a managing editor at AlterNet. Like Phosphorus In Your Water? With Trump’s EPA, You’re In Luck! What Should We Do About A Mentally Ill President? Only 6 days and Trump has put more distance between himself and the possibility of retaining his humanity. The only path Trump knows is towards an abysmal pit, at which point he can only descend—no way around the pit, or bridge across it. The upheaval caused by Trump is probably cheered by his clueless supporters, completely unaware of the precarious position he puts the nation. Losing competent personnel, and loading the WH with billionaires, and other mercenaries concerned about their own personal agendas and saluting “Sieg Heil” to Conservative Ideology, is just what people like Putin can take advantage of and exploit. So what’ happened here Otto, Trump just see a dog get hit by a car? I didn’t know the man was able to laugh. Mentally ill people laugh like him, call in the shrinks. Nero played the fiddle while Rome burned….Traitor trump laughs while the US burns. Next Benghazi in…. 3…. 2…. I wonder how many Select Committees are going to investigate Tillerson for the death of American diplomats on his watch? Zero. No, not the number of deaths of American diplomats on his watch. The number of select committees that will be investigating them. But that’s what you get when you reject everything the prior Administration has done. Can you honestly tell me you’ll want any Trump people to remain when we ride him out of town on the rails? Given the level of hate for President Obama, as evidenced by the trolls here, I’m not at all surprised. Yes, and it still is. 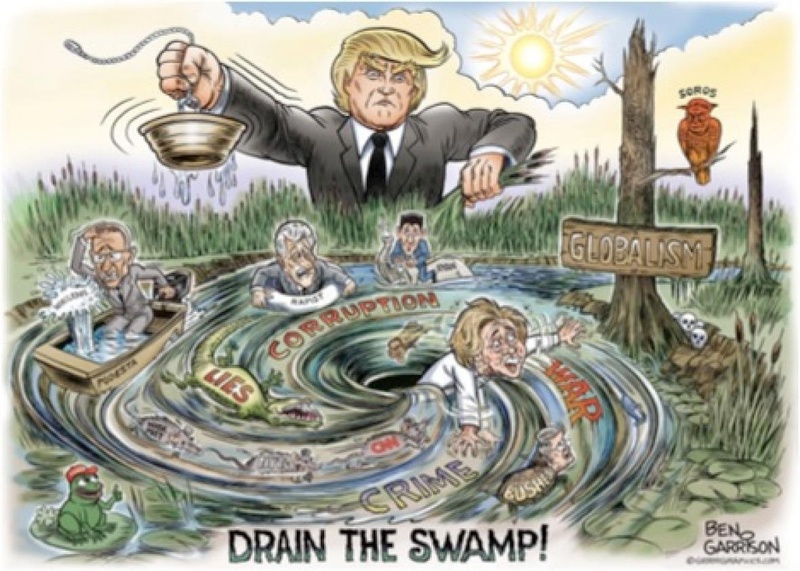 Did you notice the swamp was labeled “Globalism”? The middle guy in the cartoon looks like you, have fun going down the drain. And pull as many frogs in your family with you. That is you baby on the lilly pad, right? Who would want to work for a dictator and a medal winning.commie lover? look for more resignations from many other departments. It is not relevant who was fire or who left on their own, what is actually important and horrifying is the role those positions play in the safety of Americans traveling and living abroad and how having all those leadership position affect US security. Add to that the fact the man coming in to the top position has zero experience as a Statesman, limited knowledge of what his role and yet will have no staff to cover his back as he learns the ropes. Our thin-skinned, petty, new and zero experienced President has left a hole in a major part of the system that keeps us safe. Stupid is as stupid does. They’re no longer needed. Agent Orange gets his marching orders from Putin through Tillerson from now on. Actually, I think Bannon is Trump’s “handler” between Putin and the U.S. Government! He’s got just as much Russian experience as Tillerson and seems to be closer to the president that Tillerson. Between the two of them, Trump will end up selling this country to Russia, but only after he totally bankrupts the nation! I think the fix is already in. I doubt Agent Orange will hang around past June. It’s too much like work!! Of course, Drumpf has to counter-attack and say these employees were fired. Ha! If that’s anywhere near the truth, what a stupid, stupid thing to do. He has people who are completely inexperienced taking over departments that are crucial to the safety of this country and he’s stupid enough to get rid of the people who make this country safe?!?!? You insult all other asses! Gee, more of Trump’s “alternate facts.” He doesn’t want to admit that people are jumping off a sinking ship! I certainly don’t blame them for leaving….who’d want to work for someone that has NO qualifications for the job he’s supposedly trying to do? It’s sad that they’ve left because they took with them a lot of brains that could certainly be needed now, but they can’t be blamed! I just wish them all luck and hope that they work as tirelessly as ever to get rid of this idiot! The question is whether they were fired or resigned. From what I’ve heard, they were fired from their positions in State, but the resigned from the Foreign Service. And again. Tillerson is a better appointment than some others Trump has made. And some Trump might have chosen for State. Based on what? It is pretty easy to be a “great negotiator” when you come to the table with a wheel barrow loaded with money and promise the tin horn dictator another wheel barrow load each month. So, now we have no state department. How cute! The most important department of the US Gov — and no one to run it. I hope the nitwits who voted for the idiot are happy now. For too long now democrats, moderate republicans, and otherwise sane persons have sucked it up and done the best they could to save these radicals from themselves for the good of the country. It hasn’t worked. The quickest way to start putting things back together now is to walk away and let them crash and burn. Let them own their own disasters with no one else to blame.